Classic monkey pattern lunch box for toddlers. Long road trips can be a challenge with little ones in the car! 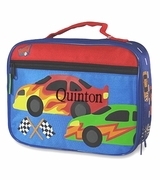 Keep them busy with snacks and games packed into this adorable little lunch tote. The cute little monkey is sure to enchant any small person as they enjoy the treats you have packed into the bag. The cute comic monkey swings from the trees and smiles at the world. Blue, green and brown create an authentic wildlife look that is ideal for girls or boys. The bag has an easy-to-hold handle on the top and a double zipper that makes opening fast and simple. An extra storage pocket on the front is ideal for small items.